With this in mind, last year I authored legislation that raises the requirement for affordable units in the County’s most expensive areas. The Council supported my plan and now we are already getting results in Bethesda, White Flint, and Rock Spring. Read the Council staff report and news coverage of the legislation. We heard some very bad news this week. In all of 2018, there were only 800 housing units added to the tax rolls of Montgomery County. . . . That is how you get a housing crunch, my friends. That is how you get an affordability crisis. These conflicting claims parallel diametrically opposed arguments regarding his proposal to make it easier to build accessory dwelling units (ADUs). While Hans has repeatedly touted his proposal as part of the “tiny house” movement and designed to allow grandma units over the garage, his proposal removes the 1200 foot cap on the size of such units. If we want small and affordable, the cap promotes this goal and Hans’s legislation should be amended to maintain it. Even more problematically, Hans has downplayed the number of units that would be constructed but proposal supporters also claim that this will be a major step in adding affordable units and that the increased supply should help depress housing prices more broadly. Of course, if the units aren’t small, they may not be very affordable. The proposal similarly cuts parking requirements because many owners may take transit but doesn’t tie the reduced parking requirements to location near a Metro line or even frequent bus service let alone actual limits on the number of cars. If we’re trying to promote smart growth, tying the proposal to transit and transit use would seem, well, smart. 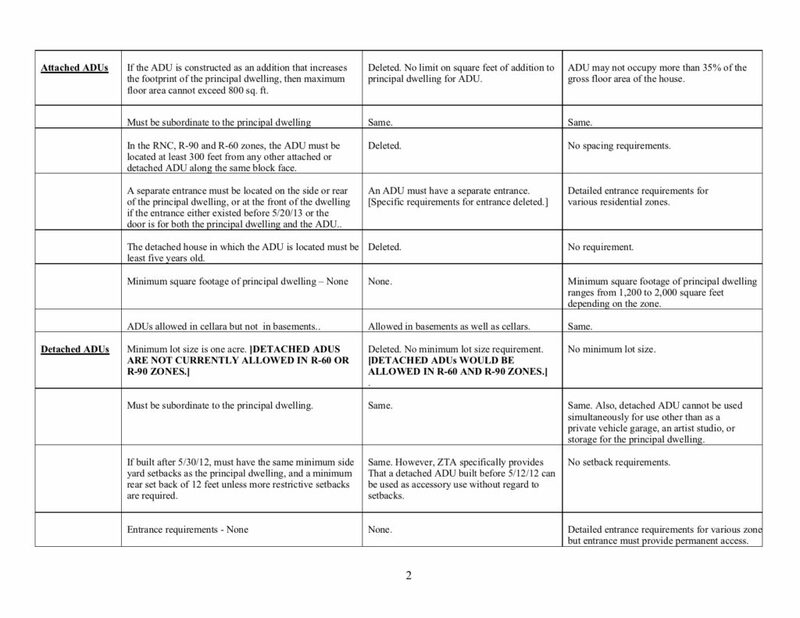 How Does Riemer’s ADU Plan Compare to Current Law? 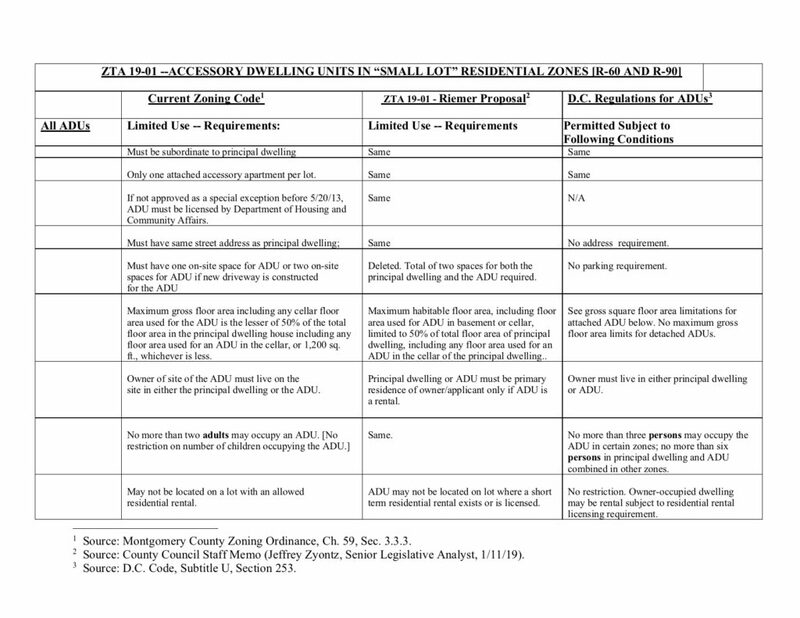 A reader sent me this nice table outlining the differences between current law on accessory dwelling units, what Councilmember Riemer’s zoning text amendment would allow, and DC law. After the jpgs of the two pages, you can view the pdf.